This sweater is iconic in Iceland. When I visited Iceland, I couldn’t wait to find out the ancient origins of the famous knitted patterns. I imagined that the traditional craft had been handed down from generation to generation, like a family heirloom. Which explains why people are wearing the sweaters without jackets in the dead of winter. I saw countless versions of the sweater in virtually every store in Reykjavik. There were various patterns and colors, some with zippers, and some with hoods, some with zippers and hoods, vest versions, versions with fur; all in sizes that ranged from infant to adult. In the Handknitting Association of Iceland, the sweaters were stacked to the ceiling, in just about every color, shape, and size you could imagine. The funny thing was, as I started to ask around about the history of the sweater, I couldn’t find any information. Not at the Handknitting Association, nor at any of the bookstores. Where were the history books with the pictures of 15th century ladies spinning wool and knitting it into primitive sweaters? I finally got my answers when I ventured to the edge of the old fisherman’s port, to the Farmers Market flagship store. It was here that I met designer, Bergthora Gudnadottir. Farmers Market, an Icelandic design company and clothing brand, was founded by Bergthora and her husband, musician Jòel Pálsson. So here it is, what we’ve all been waiting for. 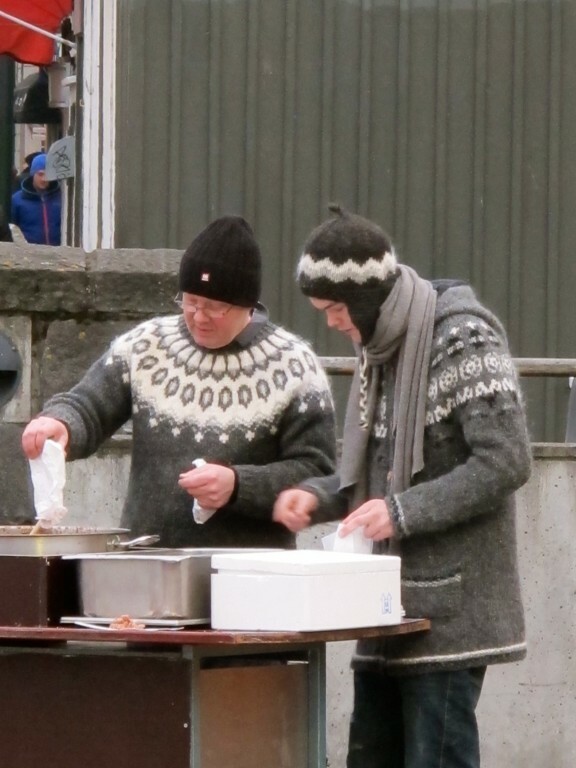 The traditional, historical, authentic Icelandic sweater dates back to . . . wait for it . . .
Not, as I had imagined, from centuries ago, and not even really traditionally Icelandic…rumor has it that Auður Laxness, the wife of Nobel prize winner, Halldór Laxness, brought a version of the sweater back from Greenland and replicated it in the late 1940’s. Designs for the sweater were inspired by old Icelandic patterns, but also from imported embroidery manuals. In the Sixties and Seventies the sweater gained widespread popularity and made a lasting impression in Icelandic imagery. The sweater received a resurgence in popularity, becoming something of a national symbol, in the movement to restore national identity and boost morale after the economic crisis in 2008. A desire to return to traditional values motivated people to create handcrafted products out of local materials. Hand-knit sweaters became so popular that knitting classes sold out, and sweaters flew out of stores. The Icelandic sweater, though not centuries old as I had thought, and not even originating in Iceland, has nonetheless become a symbol for Iceland’s heritage. As designers like Bergthora establish a fashionable image for Icelandic design, the phenomenon of those sweaters will be continue to be the driving force. What a superb article! I am crazed for for the women’s Nordic vests with the fur you featured in this article! MEOW!! After doing extensive research I can’t find them anywhere. Could you give me some assistance as to the brand name, manufacturer or the store where you took the picture? Thanks much! Lovely article and pics. It would be lovely to see that cape, perhaps modeled by … you? Happy New Year, Pam! Hi! I stumbled upon your article from the Huffington Post and am wondering if you know of anywhere in the United States that imports and sells these sweaters. Thank you! I’m so glad this story came in the midst of a very cold snap in Minnesota. It warmed my heart. That was very educational! I always wondered about those sweaters too. I LOVE the newer, contemporary designs as well as the more traditional ones. This was great! So what did you end up purchasing?? Not a sweater…I bought a gorgeous black/white/gray patterned wool cape! I really enjoyed this article and the designs are gorgeous. I wish more men would dress like the accordian player! What a great look!